In this Technical Working Papger, he generously shares his experience improving specific technical problems with stoves in Tajikistan, Pakistan and Afghanistan. In this report, he presents and improved pot skirt, stove, and chimney design for street vendors and restaurants. And he considers the multiple challenges faced by poor people in the Himalayas, where it is very cold, and there is very little wood available. 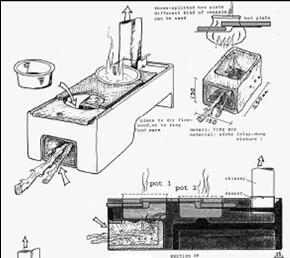 This paper includes plans for a modified bread oven that can be used as a space heater in the winter time, as well as carefully considering the many factors that go into building and using the new design. Nice article about the positive impact of improved cooking stoves in Pakistan. It's important to note that they are building the stoves themselves out of local clay, and it is making a positive and immediate difference in the reduction of smoke and the amount of wood used. I'm not sure what type of stove is being used.